Our ability to adapt is challenged and our health is affected. We reach a point where our bodies have been taxed and we start to show signs of toxic overload. It is this toxic overload that underlies many chronic diseases by affecting our immune, endocrine, neurological, and cardiovascular systems. Common symptoms improved with cleansing: PMS, low libido, brain fog, fatigue, allergies, constipation, bloating & gas, acne, anxiety, depression and moodiness, insomnia, headaches, joint pain, weight gain, food cravings and susceptibility to infections. A Closer look at our environment: Externally we are exposed to environmental chemicals and pollutants that contaminate the air we breathe, the water we drink and the food we eat. Chemicals permeate our cosmetics and our home environment. We are exposed to off-gassing from paint, carpet and new furniture. Plastics leach chemicals into our water and food supply. Pesticides are sprayed on our produce. High levels of mercury are found in our tuna, halibut and swordfish. Internally our bodies produce waste byproducts as a result of normal metabolic functions. Our own metabolism can lead to exposure to free radicals, carbon dioxide and ammonia. Our bodies can process and eliminate these toxins, but all avenues of elimination need to be working optimally in order for the most efficient elimination. Clearly, there is only so much we can do to control our environments. We can certainly gain awareness of where chemicals are found and try our best to avoid exposure and find alternatives. We can eat organic, nutrient-dense foods rich in anti-oxidants to optimize our body’s natural cleansing processes. However, the reality is that we live in a toxic world and complete avoidance is unrealistic. The exciting news is that we can commit a period of time where we minimize the chemicals we are exposed to in our environment and optimize our body’s natural cleansing processes. We have created several programs with the purpose of assisting your body in detoxifying. Each program starts with the fundamental cleanse and then adds elements that are recommended based on your individual health challenges. Our programs are unique in that that they combine tools from Western and Eastern medicine, manual therapy like massage and mind-body approaches to wellness. 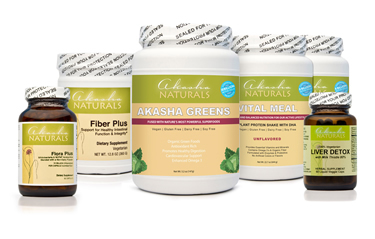 At Akasha, we offer much more than a typical off the shelf combination of supplements. We utilize the expertise of all of our clinicians to help you gain the most from this detoxification regimen. We know that the 3 week program requires much commitment on your part, and we honor that commitment by making sure you are supervised, supported and most importantly doing everything optimal to make the experience optimally beneficial for your health and wellness. The Fundamental Cleanse: All of our detoxification regimens are built on this one. After a medical visit to evaluate your needs and answer your questions, you will embark on a 3 week cleansing program consisting of medicinal, hypoallergenic protein shakes, supplements to support the liver and colon, fiber, green food and probiotics. Weight Loss Cleanse: In addition to the fundamental cleanse, this program incorporates specific protocols to assist in healthy, sustainable weight loss. Candida Detox: If you and your medical provider feel you have an overgrowth of Candida, in addition to the fundamental cleanse, your cleanse will include specific supplements and additional probiotics to assist in the clearance of these organisms which can promote unhealthy inflammation and interfere with normal gut function. Liver Intensive: The liver is the most important detoxifier in the body. For patients with specific issues related to the liver, in addition to the fundamental cleanse, specific supplements and herbs that aid in the detoxification process and help the liver to repair are added. Sugar balancing detox: Individuals with diabetes, at risk for diabetes, or problems with hypoglycemia will benefit from specific additions to the fundamental detox which help balance out blood sugar. High blood sugar leads to heart disease, nerve damage, and kidney disorders. It is especially important to embark on a sustainable program to keep blood sugar under control. Anti-Inflammation Cleanse: Inflammation is a key culprit behind heart disease, auto-immune conditions, IBS, colitis, fibromyalgia and many other conditions. To battle inflammation, in addition to the fundamental cleanse, your cleanse would include a specific protein shake that incorporates many potent anti-inflammatory herbs and natural supplements as well as extra products that help to detoxify the system, often resulting in dramatic improvement in well-being. Heavy Metal Detox: Individuals with high amounts of heavy metals (such as Mercury, Arsenic or Lead) can have many symptoms ranging from fatigue to depression to headaches. Our heavy metal cleanse incorporates herbs and natural supplements in addition to the fundamental cleanse to help clear metals from the body.